RAJAN NAIDOO is passionate about the development of people and as head of the EduPower Skills Academy, he is committed to changing the lives of as many young South Africans as possible - through quality learnership programmes. Growing up in Shallcross in Durban as the youngest of five children, Naidoo started working after he matriculated. Employed as a factory worker in the furniture industry, he studied part-time through UNISA and completed a diploma in Data Metrics and a B.Comm. "There wasn't much opportunity in the mid-80s. If you could get a job, you held on to it and studied parttime to improve your opportunities. I was interested in the management of data as this was a very new field, and later coupled this with a B.Comm so that I would understand business," Naidoo explains. Naidoo entered the world of finance, working for one of the banks that would become part of ABSA. In the 14 years he worked there, he was exposed to personal loans, collections, call centres and vehicle finance, climbing the corporate ladder as he went, and gaining invaluable experience in the world of finance. 'In 2003, I changed fields completely when I moved into supply chain management for the Services SETA (Sector Education and Training Authority). This was the start of my career in education and I realised it was my passion. I worked in various roles within the SETA for 10 years, the last of which was as the Director of Discretionary Grants," he adds. Here, Naidoo had practical experience in a wide variety of regulatory frameworks including BEE. When he moved back into corporate in 2013, he joined Daly Credit Corporation in a role that combined his expert knowledge of compliance and his SETA experience of training. It wasn't long before he headed up the Database Administration (DBA) & BI (Business Intelligence) teams too. One of Naidoo's strengths is his creativity and ability to think outside the box, and he saw an opportunity for the training department to become an independent company, growing the business by offering skills development training to external companies too. "It took some convincing, but we finally opened EduPower in 2016 - a skills development academy providing both accredited and non-accredited short courses," Naidoo explains. "I'm confident we offer one of South Africa's top entry-level training opportunities - which includes an experiential training contact centre to gives learners real skills they can use to build lasting careers." But what really sets EduPower apart is that it offers hosted learnerships - hosting client's learners on site for the full 12 month programme, including learners with disabilities. This means the disruption to businesses funding the learnerships through their B-BBEE spend is minimal. This innovation appeals to many companies and the Academy's clients include Toyota, British Telecoms, Roche and Hudaco. Naidoo's strong team facilitates end-to-end service for these clients and are just as passionate about growing the company. "Developing my people is incredibly important to me so my leadership style is participative. I engage with the team constantly and take time to listen to their opinions. My thinking and ideas are not always understood initially, but by showing everyone how these can add to our success, they quickly get on board." Naidoo is inspired by social transformers and has read extensively about Ghandi, Martin Luther King and Nelson Mandela, who was a social transformer long before he became a national hero. Other role models include Dr Albert Schweitzer and Albert Einstein, who spent the latter part of his life promoting social causes. He believes these role models make him more human. "I don't see people as statistics or numbers on a page. That's why training has to have an outcome - giving people meaningful opportunities is what my life is all about." It is also the reason Naidoo has devoted much of his personal time to making a difference in the lives of the people in his community. 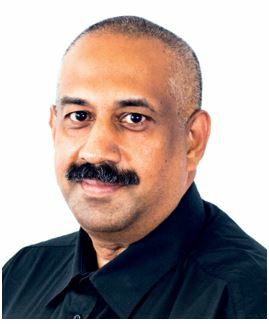 From founding and coaching a men's and women's basketball club, to being the first KZN coach of a women's under-18 unsegregated basketball team, to fundraising for and preparing sandwiches for children in underprivileged schools, to tutoring scholars struggling with mathematics, Naidoo continues to give selflessly of his personal time. And together with his wife of two years, Naidoo has just registered his latest venture, an NGO for young entrepreneurs. "Our young entrepreneurs are agents of transformation in our country. They have incredible ideas but often don't have the business skills to start and operate a company - by providing this training for them, their natural flair can take them to the next level." With this dream and the dream he has of transforming the lives of young people through EduPower, Naidoo will continue to make an impact on the future of South Africa.